Tom Maresca: Wine writer, author, friend, traveling companion etc – sent the following e-mail to fellow members of the Wine Media Guild. Dear WMG members: Tomorrow (Tuesday, 19 Jan) I’ll be posting a piece about Italian wine law in general and Chianti Classico in particular on my blog (see signature), and I’m really interested in hearing your reactions to it, whether you choose do so on site or privately by email. Thanks for any thoughts you care to pass on. My response was very long, so I decided to post it on my blog because I think Tom discusses important issues. The article is in two parts. There are some comments by other Wine Media Guild members at the end of Tom’s article. I agree with you that there is great confusion when it comes to the Italian wine laws in general and Chianti in particular. It was the producers of Chianti that asked for changes in the law hoping to make their wines more international in style and therefore easier to sell. Producers that were not in the Chianti zone want to be included because if the word Chianti is on the label they could sell the wine for more money. I believe there are eight Chianti zones plus one to cover the producers in the “spaces” between the zones and a special one for Chianti superiore. The laws for Chianti have changed so many times over the last few years it is very difficult to know what grapes are in the Chianti you are drinking. Adding to the confusion is the love affair that the Chianti producers have with internationalgrapes. Is there really any difference between a Chianti riserva and a Super Tuscan, when a producer can put 20% of a foreign grape like Cabernet Sauvigion or Merlot in his Chiant? Then, they use whatever modern methods they can to get as much concentration and extraction from the grapes and then age it in new barriques. Many of these producers insist that they are traditionalists but make international style wine. In private many will also say that they do not drink these modern style wines but make them for the market. They do not drink these wines because they do not work with food. It seems to me that they are not making the best wine they know how but making the wine that will sell. Yes, I understand that they are in business to make money. What is a modern day producer going to say, my grandfather made better wine then me? The wine press gives these modern style wines very high points. By doing this they have let the consumer down and encouraged wine makers to make this style of wine. Why is it now unacceptable to drink simple Chianti? What could be more enjoyable! I long for the days when I would go to a restaurant in Tuscany and the waiter would say “vino bianco o vino rosso”. He would bring a wine that went better with my food then anything I could have ordered off any wine list. I do love the taste of Sangiovese. I believe that the old Baron had the right idea. There were many great Chanitis made going back to the 1920’s. The 1925 Carmignano, for example, called simply Chianti, which I had with Conte Bonacossi in 1985 (I know there is a tradition of Cabernet Sauvignon in the area but none was used in this wine). Also, the 1947 Ruffino gold label we drank together. 57 years old and everyone knows that wine made with white grapes and the governo method cannot age! The governo method is not good for the wine, the producers will say, it is not good because it is an expensive process. I drank and am still drinking-not often enough- Chianti Classico from the 1970’s. In fact I had a 1978 Badia a Coltiburno riserva at Keste last month. There is more than a handful of producers that made great wine in the past: Castell’ In Villa, Giovanni Cappelli “Fattoria Montagliari”, Monsanto ‘Il Poggio”, Ruffino Gold Label, Villa Antinori, Villa Antinori Marchese, Villa Cafaggio, Brolio, Carobbio, Castello di Fonterutoli. Nozzole, Castello di Volpaia, Fontodi. 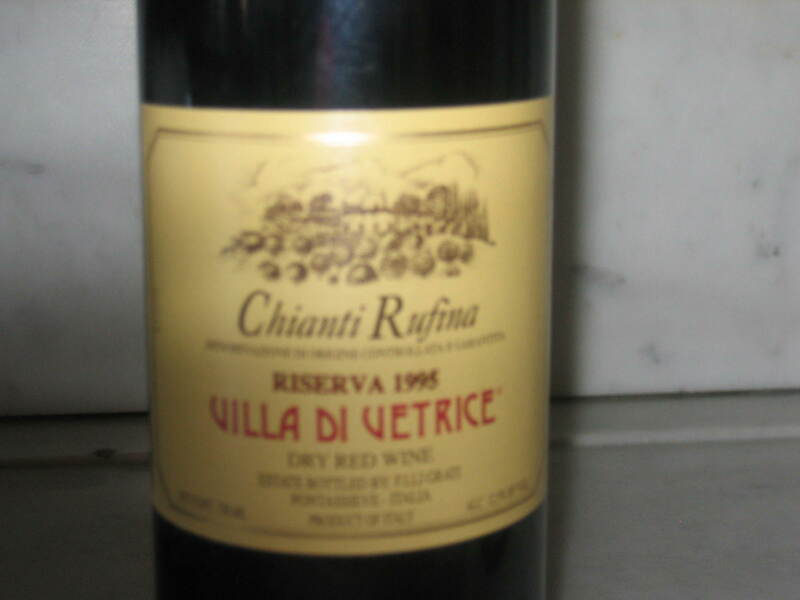 Isole and Olena and Chianti Ruffina Villa Di Vetrice to name a few. In fact most of them made better wine 35 years age than they do today. The changes over the years have led to confusion, not better wines. Better wines only if you think that the use of barriques, concentrated grape flavors, no feeling for the grape or for terroir improves the wine. Do most people want all wine to taste the same? Is the international style the only one the producer and wine writers want the consumer to buy? Give me a wine that tastes like wine! As for the scandals, I will quote a very learned friend. Every time something goes wrong when we are in Italy together he will turn to me and say “Siamo in Italia”. End all the confusion, give me wine that tastes like wine. Well said. Isn’t it funny how some influential wine writers know everything today? They should drink wines that you have enjoyed over the years before they reward the international-styled wines with such high marks. As you say, are these new wines really Chianti? I tasted the new 2008 Carpineto Chianti Classico today at an anteprima event in Chicago. It was a pleasure to enjoy such a straightforward, elegant wine that tasted like a Chianti that one would drink to pair with a simple meal and not to impress someone. I doubt this wine will score very highly in certain publications, as it’s not a powerhouse wine. But I prefer wines I can drink with food – it’s that simple. As you both know, I’m in substantial agreement with both of you. I too wish the wine laws were more transparent: as Charles says, what is the difference between a Supertuscan and a Chianti Classico when both can be 100% Sangiovese or both could contain Cabernet or Merlot? That’s a distinction without a difference if I’ve ever encountered one. But I have to disagree strongly that “things were better in the old days.” Yes, there was a handful of great wines being made, and a carload of dead-in-a-year plonk. There are far more serious producers now, and far more good wine being made — especially in the Chianti Classico zone — than ever before. Even subtracting the over-barriqued, over-caberneted percentage, more excellent Chianti Classico (both normale and riserva — is now available to us that we were ever able to get before. I’m as nostalgic as the next guy, but let’s not ignore the riches we’ve got.